Let me re-up my characterization of National Audubon as a bunch of jackasses. Originally I found them to be especially thin-skinned over this article in response to Jonathan Franzen. However I was reading a NYTimes opinion piece on social media's reaction to a Moustached Kingfisher's killing in the name of research, which in due course let me to National Audubon's reaction, which reaches new lows - rarely do I find such sustained condescension and belittlement towards non-scientists. It's basically "this is not a debate, you are all idiots". The much-ballyhooed justification for the take - that it contributes to science - has little evidence to support it because as of writing the only publication from that group related to that Kingfisher appears to be the bragging rights of photographing a male for the first time, shortly before killing it. Hard to imagine an organization less deserving of your dollars, although AMNH appears to be associated with the original research effort. Quick an trip to Florida in mid-December 2015 - Western Spindalis and four Floridian exotics (Egyptian Goose, White-winged Parakeet, Red-whiskered Bulbul, Spot-breasted Oriole. Some notes I wrote about an odd flycatcher observed in Central Park on 9/12/2015 and the sometimes more-difficult-than-expected issues with differentiating Empidonax from Pewees. 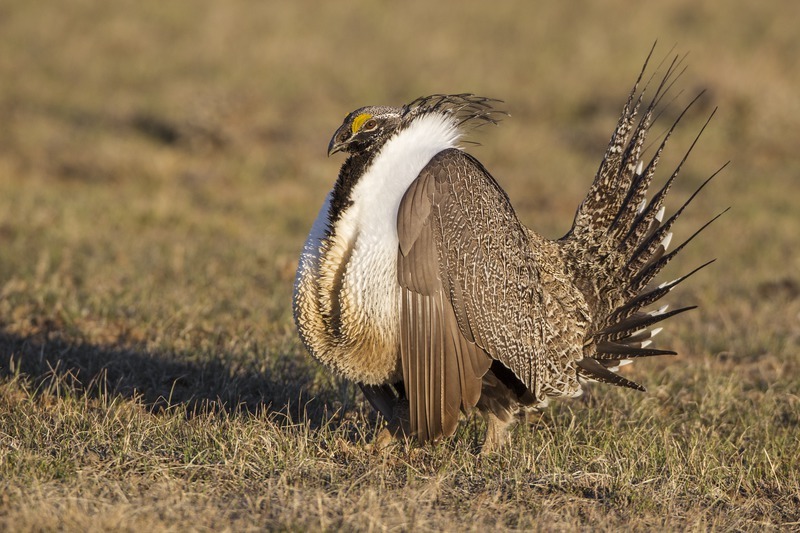 National Audubon seem especially determined to act like a bunch of jackasses because they don't seem to be able to take criticism from a book author on the actual causes of threats to bird populations. You would assume they would have more of a clue, but this reaction makes me think that it would be a good time to reconsider donations to that organization. Trip report for CA Pelagics in September 2013 (Buller's Shearwater, Flesh-footed Shearwater, Ashy Storm-Petrel, Black Storm-Petrel, Scripps's Murrelet, Bell's Sparrow). Of interest perhaps solely to me, I've been dabbling in Python as a means of probing the eBird API. My first project along these lines is "Year Bird/Life Bird" at yblb_py.cgi. Trip report for AZ in June 2013 (Spotted Owl, Northern Pygmy-Owl, Mexican Whip-poor-will, Buff-collared Nightjar + Mountain Lion). First stab at trip reports from FL in April 2013 (Mangrove Cuckoo, Thick-billed Vireo + two exotics) and NC in May 2013 (no link to that one yet, Black-capped Petrel and Band-rumped Storm-Petrel). Trip reports from TX in January 2013 (Flammulated Owl) and AZ in February 2013 (Western Screech-Owl, Le Conte's Thrasher + the Lovebird). Trip report from my summer 2012 AK trip which took me to Homer, Seward, Nome and Anchorage in my first trip to that state and produced 20 new life birds (incl Gyrfalcon) and a Wolf. This is what you get for talking to journalists: a "fluff piece" on CPK birding from the NY Times - actually a few birders who mentioned it to me quite like it, and it's nicely done. 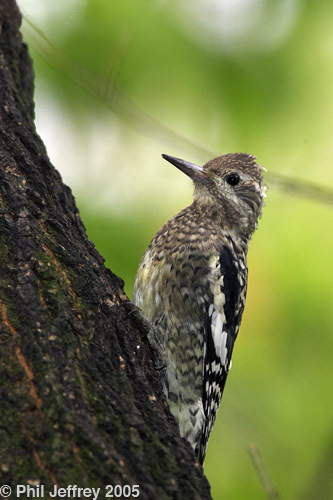 Central Park Birding provides information about birding within Central Park. Not very creative but always quite birdy, I reprised my recent April Texas migration trips in spring 2017. This had worse luck with passerine migrants (only 17 warbler species) but still netted 240 species in 9 days of birding and scored both Black Rail and Yellow Rail via the Anahuac NWR Rail Walk, and had other interesting birds like Red-billed Pigeon and Zone-tailed Hawk. See: for a provisional trip report. Only a little less rare in the Lower 48 than the Amazon Kingfisher was the first winter immature Ross's Gull that showed up on a mostly-frozen Tupper Lake in the Adirondacks and put on a pretty good show when I went to see it on Jan 31st. Lower 48 #702 and USA #725. Ross's has always been a "400 mile bird" for me (miles I'm willing to drive to see it) given it's very rare/spradic occurence anywhere that doesn't involve freezing the balls of a brass monkey in Barrow in October. Still it was -13 F when I got to Tupper Lake, so perhaps Barrow might have been warmer. Ewing NJ to Tupper Lake NY is 345 miles. At the end of a business trip to TX to evaluate a replacement single crystal X-ray machine I availed myself of the long-staying Amazon Kingfisher that was down in Laredo, which flew right past me at the mouth of Zacate Creek but didn't perch up long enough to get bad photos (the camera was in the car due to drizzle and generally ugly light). Ringed and Green Kingfishers were also in the creek and I completed the "kingfisher grand slam" (all 4 US recorded species) by mid morning on the spring towards the coast. It persisted through about Jan 20th 2017, being a lot more cooperative than the first and second US records were (this is the 3rd). The split of Western Scrub-Jay into California and Woodhouse's Scrub-Jays put me in the nervous 699's for my Lower 48 Life List so I finally made the oft-deferred run for the Maine Red-billed Tropicbird that has been summering on Seal Island NWR for the last 12 years (2005-2016). For a warm water bird this anomalous individual is certainly fond of the colder water in Maine. Seal Island NWR is the site of one of the Atlantic Puffin recolonization efforts, with some success. I found a mainland boat trip option via Old Quarry Ocean Adventures whose Puffin/Pelagic Tour is now timed to take in the tropicbird - it likes to appear after 4pm. Runs every Tuesday afternoon in summer - consult their website. All the rest of the bird activity was modest (the Razorbills had fledged and left the island - there was only 1, no Common Murres, but plenty of Atlantic Puffins) but the star of the show turned up at 4:12 by skimming low off the island and preening obligingly nearby. Lower 48 #700 and USA #723. May/June 2016 - Alaska trip placeholder for trip report. 6 life birds: Common Sandpiper, White Wagtail, Least Auklet, Crested Auklet, Rock Sandpiper, Red-legged Kittiwake and several very nice revisits - Gyrfalcon, Bristle-thighed Curlew, Emperor Goose etc. That Hermit Thrush was cool to behold, but soundly trumped by a rare migration overshoot bird - a Swainson's Warbler in Strawberry Fields. A Singing. Swainson's. Warbler. My 31st warbler species for April, and a bird that I never thought I was going to add to my CPK list. In fact I heard it singing less than 15 seconds after arriving on site and while foraging in the leaf litter quietly it did give relatively good views in relatively dark conditions. A Hermit Thrush with a ghostly whitewashed appearance seen throughout the day at the charmingly-named Mugger's Woods in The Ramble. I rarely-to-never see any kind of leucism in thrushes, so this is a particularly dramatic example. Somewhat pointed tail feathers make me think it's a first spring bird. Trip report pending, trumped by other events. Spring migration + Crimson-collared Grosbeak, White-collared Seedeater, Red-billed Pigeon. 242 species in 8 days. Mid-December two-and-a-half day trip to Florida for Western Spindalis came up with that vagrant and also four Floridian exotics (Egyptian Goose, White-winged Parakeet, Red-whiskered Bulbul, Spot-breasted Oriole. Arizona early summer trip netted of all things a nesting Tufted Flycatcher in upper Ramsey Cyn, a Flame-colored Tanager in lower Ramsey Cyn, Elegant Trogon nearby, Montezuma Quail in the Chiricahuas and a fairly standard set of south-east AZ specialities. Just having returned from Texas where I saw my third and fourth Chucks on South Padre Island I caught the last day's appearance by the Chuck-will's-widow at Bryant Park, which continues to deliver truly remarkable migrant birds for a busy and small park smack in the middle of midtown Manhattan. This one is my fifth and the third one in NYC. Texas early migration trip covering migrant hotspots on the Upper Texas Coast and Lower Texas Coast and also some of the Lower Rio Grande Valley specialities. Some notable finds were: White-collared Seedeater, Tropical Parula and some pretty good RGV semi-regulars included Aplomado Falco and Clay-colored Thrush. A Swainson's Warbler was seen on migration at Sabine Woods on only my second visit there ever. This was my second individual and the first I'd ever heard sing. December trip to Australia, spending a few days in California at either end of it. New species for USA were Thayer's Gull and the newly-minted Ridgway's Rail. New species for Australia were very numerous indeed since I've never been there before. June trip to Utah, Colorado, Wyoming, Montana, Idaho anchored around Grand Teton and Yellowstone NP. Apart from the spectacular scenery and a lot of big mammals (excl. tourists: Grizzly and Black Bears, Elk, Buffalo, Pronghorn, Mountain Goat) I found some interesting birds (White-tailed Ptarmigan, Dusky Grouse, Black Swift). Chickens: an April re-creation of my 2004 "Chicken Tour" found most but not all of the target grouse and chickens, and was a prelude to a hike into the Chisos Mtns at Big Bend NP for Colima Warbler, followed by tracking down the long-staying Streak-backed Oriole at Washington Ranch (Rattlesnake Springs) in New Mexico. A quick day on the upper Texas coast got me a trip list of 236 and a quick preview of eastern spring migration in this tripartate birding trip featuring 3 states and well over a thousand road miles. A January visit to Arizona cleaned up a few birds that I missed out on in 2013: Nutting's Flycatcher, Ruddy Ground-Dove and Black-capped Gnatcatcher. I also got to see Blue-footed Booby in AZ waters, which in itself would be remarkable if not for the preceding Booby-invasion of 2013. 2013 wound up as the designated push for 700, with a total of USA 7 birding trips (trip reports, each edited to a greater or lesser extent, linked below). I'm still working through the photographs generated from these trips. It also featured a couple of significant invasion years: a large fall influx of Blue-footed Booby into AZ and southern CA, with double digit counts at the Salton Sea and individuals found all the way up the west coast, as well as inland birds at Patagonia Lake (AZ) and Lake Havasu (AZ/CA); an equally remarkable push of Snowy Owls south to the eastern seabord, with high counts of ~300 in Newfoundland and multiple Snowy's at many coastal and some inland locations on the NY-NJ-DE axis. I saw at least seven between Thanksgiving and New Year's, and added Snowy Owl to my PA and DE lists. "Blue-footed Booby" trip designed to take advantage of the Booby invasion, and a certain twitchiness related to sitting on USA 697. Blue-footed Booby (#698) in Playa Del Rey (Los Angeles), a big flock of Black-vented Shearwaters (#699) at Will Rogers State Beach (also LA), and Island Scrub-Jay (#700!) at Santa Cruz Island. The ferry ride to Santa Cruz was also a notable mini-pelagic in and of itself (two shearwater sp, Fulmar, 2-3 Jaeger species). #701 was Nutmeg Mannikin (yes, also in LA) on the morning before the flight out. Other good birds included White-headed Woodpecker up in the San Gabriels. I may have to retract all the bad things I've said about Los Angeles, minus the traffic which was exactly as horrendous as you'd expect. Monterey and Half Moon Bay pelagics, with the Half Moon Bay one being the better of the two: life birds Buller's Shearwater, Scripps's Murrelet, Ashy Storm-Petrel, Black Storm-Petrel and Flesh-footed Shearwater on the pelagic, Bell's Sparrow on the break day between pelagics, and my first Blue Whale on the more subdued Monterey Pelagic. Impressive number of pelagic birds, an amazing number of Humpback Whales at Monterey Bay, and surviving two pelagics without chumming over the stern made for a great trip. Great Shearwater was a good find for California, though not so much as a year bird. Life birds #692-697. Arizona late spring trip. Life birds Spotted Owl, Northern Pygmy-Owl and Buff-collared Nightjar were found on day 1, and unlikely 3-in-one-day trio including actually seeing the Nightjar. Later in the trip I discovered another Nightjar near to the first one. The fourth and final find was a Mexican Whip-poor-will courtesy of Matt Brown, on an evening trip up Harshaw Canyon that included a sighting of a Mountain Lion. Life birds #688-691. White-eared Hummingbird was the other notable find (Miller Canyon) along with the usual spectacular AZ specialities like Buff-bellied Flycatcher and Elegant Trogon. North Carolina pelagic trip netted life birds #686-687: Black-capped Petrel and Band-rumped Storm-Petrel as well as the usual suspects: Great, Cory's and Audubon's Shearwaters and Wilson's Storm-Petrel. Bouncy weather made for an "interesting" ride. FL birding trip 2013 including Mangrove Cuckoo and Thick-billed Vireo. The Mangrove Cuckoo was the result of about 20 cumulative hours of birding mangrove habitat for this especially elusive bird. The Thick-billed Vireo (far, far rarer) took about 5 minutes. Life birds #682-685. Fieldfare in Carlisle MA. USA #681 for me - a species I had seen many of before in Britain but quite rare in the USA. Tufted Duck in Huntington, Long Island. This was the first one I'd seen in about a decade, and likely the same individual that I'd chased at Halesite nearby on the north shore earlier in the winter. A good winter for Tufted Ducks, there were two on Long Island this winter and another one found in southern NJ in March. This was seen on the same day I saw the Gyrfalcon at Gilgo Beach (my first in the lower 48), a pretty good day for rarities, if a cold one. AZ birding trip 2013 including Le Conte's Thrasher, Western Screech-Owl, Rosy-faced Lovebird (and this Burrowing Owl). TX birding trip 2013 including Flammulated Owl. The idea of seeing a Flammulated Owl at sea level in January is pretty novel, but apparently there are a few records of them migrating through the area. AK birding trip 2012 was a marked success, including the Nome segment, finding a total of 21 life birds: Arctic Loon, Red-faced Cormorant, Emperor Goose, Steller's Eider, Spectacled Eider, Gyrfalcon, Willow and Rock Ptarmigans, Wandering Tattler, Bristle-thighed Curlew, Bar-tailed Godwit, Surfbird, Aleutian Tern, Thick-billed Murre, Kittlitz's Murrelet, Ancient Murrelet, Parakeet Auklet, Horned Puffin, Arctic Warbler, Bluethroat, Eastern Yellow Wagtail. Obviously not my last trip there. FL birding trip 2012 proved that Mangrove Cuckoo and Black Noddy were indeed elusive birds, but I did snag a few consolation prizes: Masked Booby, Sooty Tern, Brown Noddy, Antillean Nighthawk, Black-whiskered Vireo, Common Myna, Shiny Cowbird. Razorbill in Manasquan Inlet giving point blank looks - not a rare bird but an unusually close look at one with my feet on solid ground. Rufous Hummingbird at American Museum of Natural History and Dickcissel at Inwood Hill Park. The immature female Rufous Hummingbird became the first hummingbird to be known to survive overwintering, including completing molt before departing in March 2012. Gray-hooded Gull on Coney Island. Only the second US record for this species - the other one being a momentary wonder down in FL - this individual persisted at Coney Island for a number of days giving point blank looks on the beach in front of the boardwalk. Seasickness be damned - I went on an underachieving March pelagic out of Belmar NJ on March 26th. It wasn't particularly productive for alcids apart from lots of distant looks at Razorbills, and wasn't even that good for Gannets, but the upsides were close looks at the trio of Glaucous, Iceland and Lesser Black-backed Gulls. My first trip to Florida in several years in March produced pretty much the usual suspects but included nice looks at Short-tailed Hawk (see pic), and one life bird in the relatively rare La Sagra's Flycatcher. See the trip report for more details. A trip to Texas again in January 2011 netted two life birds: Black-vented Oriole and a surprise Rufous-backed Thrush, and also other nice birds like Tropical Parula. See the trip report for more details. Fork-tailed Flycatcher in Stamford CT: pics one, two, three and four. Also video. Atypically for a Fork-tailed Flycatcher this bird stuck around for quite a while, giving masses of birders some very good looks. Loggerhead Northern Shrike (first winter immature) at Jones Beach State Park: pics here and here. Mew/Common Gull in Brooklyn. More specifically Gravesend Bay, west of Coney Island. This bird (click link) is a basic-plumaged adult, possibly of the European subpsecies Larus canus canus. It also appears to have a slightly deformed bill, being somewhat rounded at the tip possibly from an extended upper mandible. Other than that, there was no summer trip and so it has been a relatively quiet year for rarities. A trip to TX in Dec 2009 - Jan 2010 netted a variety of species including two lifers: and adult Northern Jacana at Choke Canyon State Park; an a USA-first record of an immature (but near-adult) Bare-throated Tiger-Heron at Bentsen Rio Grande State Park. Such is the nature of the trip that both managed to appear on both 2009 and 2010 year lists. The trip report for my two week, 5,500 mile road trip MN-ND-MT-WY-SD-ND-MN is online with links to some of the pictures I took during the trip: Nelson's Sharp-tailed Sparrow, Black Tern, Upland Sandpiper, Western Grebe, Black Rosy-Finch etc. Images from that trip are also in a dedicated gallery folder. A regular but borderline rare migration overshoot bird, this male Yellow-throated Warbler was present in Central Park from at least April 10th-13th. Pictures at YTWA_2009. This Harris's Sparrow was discovered in Brandywine Creek State Park in Delaware on Oct 11th and was still present as of Nov 2nd. I went down and saw it on Nov 1st and found it to be quite cooperative, in contrast to the only other one I'd seen nearly nine years earlier. Pictures at Harris_2008. 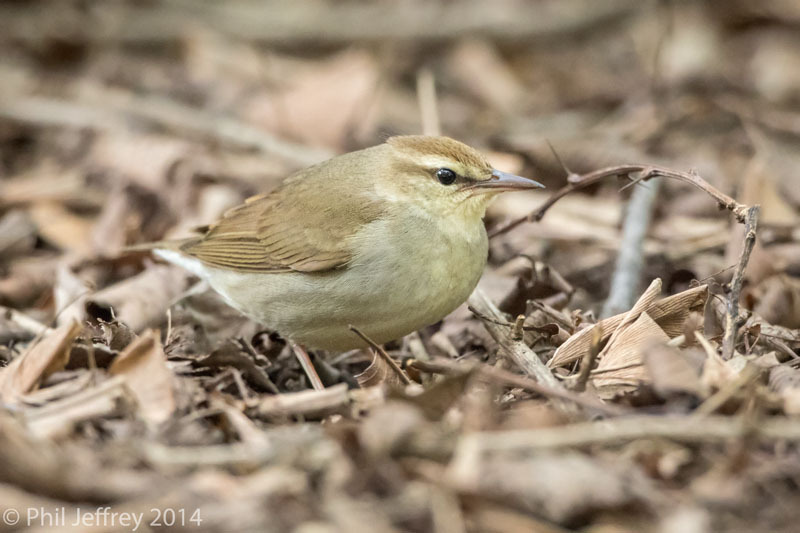 This Connecticut Warbler was found by Tony Lance at the Pinetum in Central Park on Oct 5th 2008 and seen by many (click on icon to see pics). 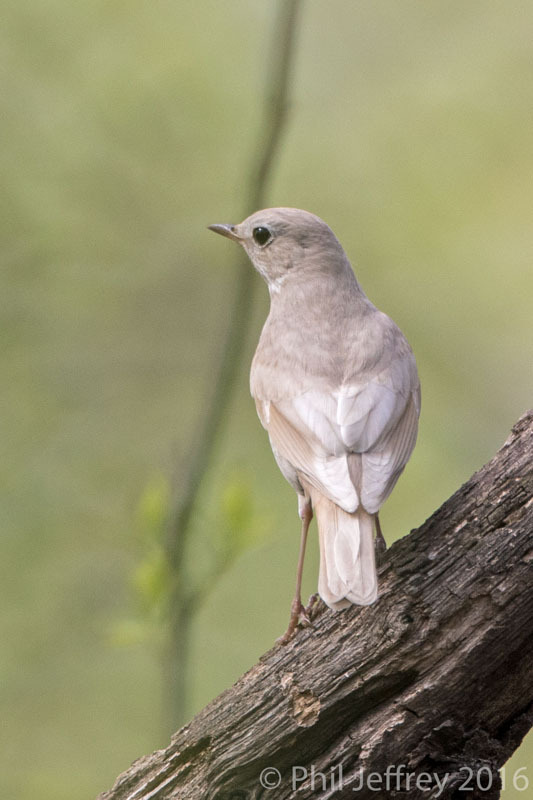 The bird stayed for at least three days in the vicinity, and although rather late for a Connecticut in the east, other Connecticuts turned up in the region over the same weekend. The icing on the cake of 18 warbler species for the day was a singing adult male Cerulean Warbler on a residential street on the Upper West Side. The Cerulean Warbler page contains pics and a little additional context. A birding trip to central and southern TX on April 10th-18th had unusually good luck and netted all the target life birds: Black-capped Vireo, White-throated Robin, Red-billed Pigeon, Hook-billed Kite, White-collared Seedeater, Ferruginous Pygmy-Owl, Groove-billed Ani and Aplomado Falcon. I've edited the trip report but there are no photos added yet. The Rio Grande border fence, as currently proposed, promises to eviscerate threatened habitat and bury at least one precious preserve behind the fence in the name of "security". Thankfully there's growing resistance to it in Congress, although time is short. Read my post to NYSBirds-L on this subject. Also I made an analogous post to the group eBirdsNYC back in May 2007. The fence is scheduled to be completed by the end of 2008. A first spring Western Tanager was discovered in Central Park on March 26h 2008, and I took a few average photos of it on March 30th. I've placed some discussion of the ID here. I personally lean toward immature female. 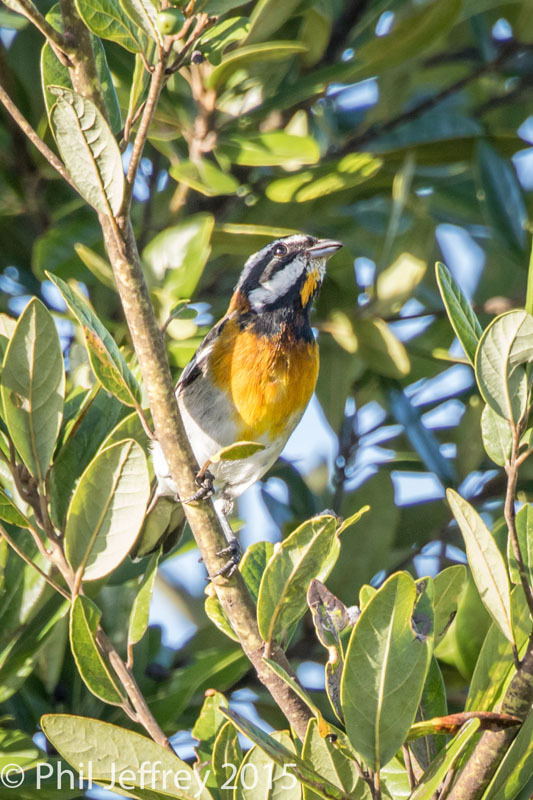 After an initial discovery on Dec 4th, a Scott's Oriole went unidentified until Ardith Bondi posted her pictures of it on the net. A brief ID revision later, and Union Square Park became the latest venue for rare bird seekers - this one a potential first state record for Scott's Oriole in NY. I waited until Jan 28th to visit the bird one sunny morning, and it did oblige a couple of times in posing for photos. (See here for images and text, or my gallery page for this species). This individual appears to be a match for a first winter immature male. Spent half of one Sunday rummaging for boreal species along the southern edge of the Catskill Mtns in Sullivan County NY. Mixed results, but some very nice views of Pine Grosbeaks in Grahamsville (click on icon or here). Rough-legged Hawks were also present in decent numbers (4) at Shawangunk NWR including a dark morph. I had not seen that species in a few years. Short-eared Owls were conspicuous by their absence in frigid and windy conditions, however. To cap a very waterfowl-intensive 8 days that started off with Masked and Muscovy Ducks in TX on November 14th, I drove all the way to Montauk on Long Island to find the Pink-footed and Barnacle Geese that were at the Deep Hollow Ranch in Theodore Roosevelt State Park. Both were ultimately quite cooperative - see the pictures here. Also at the site were two Western Kingbirds and a flock of Red Crossbills. A very brief trip to Texas in the week before Thanksgiving was prompted by the presence of breeding Masked Ducks in a roadside pond north-west of Corpus Christi. These turned out fairly easy to find but the icing on the cake was seeing three Muscovy Ducks at the Salineno boat ramp to the Rio Grande river at dusk of the same day. The rest of the 3.5 day trip turned up the usual suspects and there were a lot of road miles involved (Houston to the RGV and back). This Connecticut Warbler turned up in Central Park on Sept 8th 2007, found by Tony Lance and seen by many (click on icon to see pics). The bird lingered near Hernshead in what was at times a surreal location just behind an amplified guitar player who was "entertaining" an audience on the west shore of The Lake. Apparently oblivious to all the fuss, the Connecticut persisted until late in the day but was not found on subseqent days. This was one of a series of Connecticut Warblers that were to show up in Central Park that fall, including another exceptionally tame one up at Sparrow Ridge (Sept 18-20th) and a more elusive one at Summit Rock (Sept 23rd). (click on image for larger version). An exceptionally rare find of a Western Reef-Heron (or if you prefer, Western Reef-Egret) was made by Alex Wilson on July 8th at Dreier-Offerman Park in Brooklyn - now apparently renamed Calvert Vaux park, not that this location would have been appreciated by Mr. Vaux in it's current form. Apparently quite wide-ranging, this bird was also sighted from Staten Island and also from Sandy Hook. It was also not entirely reliable at the Brooklyn location, but nevertheless many people got to see this remarkable rarity. 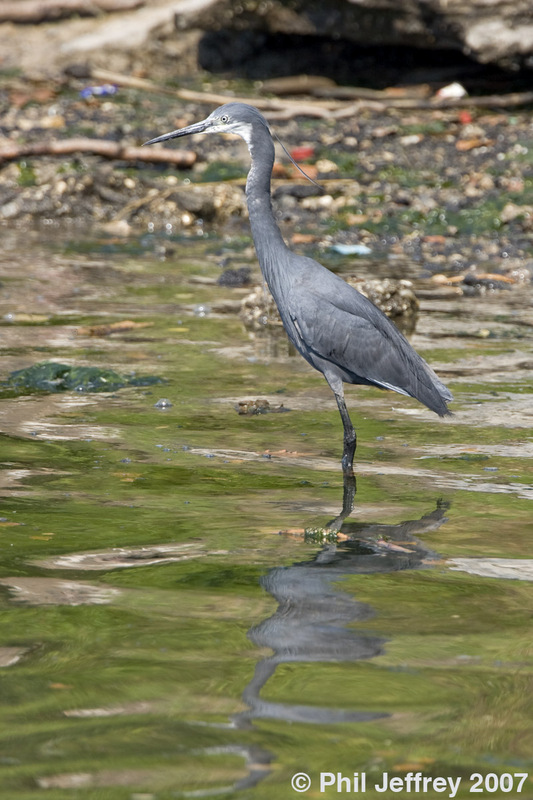 Western Reef-Herons have been cropping up on the east coast over the last few years. There was one in Newfoundland in the summer of 2005. There was one in Nova Scotia from June-August 2006, and another one or the same one in Maine and NH August-Sept. 2006. Apparently prior to this cluster of sightings the only other record was from Nantucket (MA) in 1983. Either we're getting really good at finding Western Reef-Herons or they are getting really good at finding us. The species is apparently closely related to Little Egret (itself very rare in the US) and some authorities consider it a subspecies of that - there appears to be no firm concensus on the situation as of now. This adult male breeding plumage Curlew Sandpiper was at Heislerville WMA in NJ on May 13th 2007, one of at least three that were at that site in spring 2007. This was one of a series of five Curlew Sandpipers seen in southern NJ in May 2007 - three at Heislerville (1 male, 2 females), and ones at Stone Harbor Point and Brigantine NWR. Click here for pics or on the image. This Summer Tanager was highly cooperative in Central Park on May 13th 2007 - seen at eye level multiple times and also on the ground. The bird appeared to be in molt - the uppertail coverts in particular were both a deep red and also not lying flat. Closer inspection of the photos reveals that one central retrix (R1) was fresh and probably still growing, as well as one or two innermost tertials. The rest of the tail feathers were relatively abraded, as you'd expect. Based on a combination of features, this is a first spring male: the deep red of the undertail and uppertail coverts, the replacement of that central retrix (just the one, although conceivably this could be from damage) and the relatively pointed outermost primaries and retrices. Most passerines do not replace their flight feathers (incl. tail feathers) in the pre-alternate molt, although apparently this sometimes happens in hatch year birds (as per Pyle - Identification Guide to North American Birds). Feather shape seems like a decent fit for a first (calendar) year bird. Click here for pics or on the image. Whip-poor-will, Hooded Warbler and Snowy Egret were all to be found in Central Park on April 30th 2007, the best migration day of the season so far. I also managed to find 11 species of warbler, considerably improving over the mere 4 the previous day. Click on the icon or click here to see pictures of these three species. Perched goatsuckers such as Whip-poor-will are sometimes the subject of not inconsiderable ID debate although Whip-poor-will is expected to be the commonest of the two. 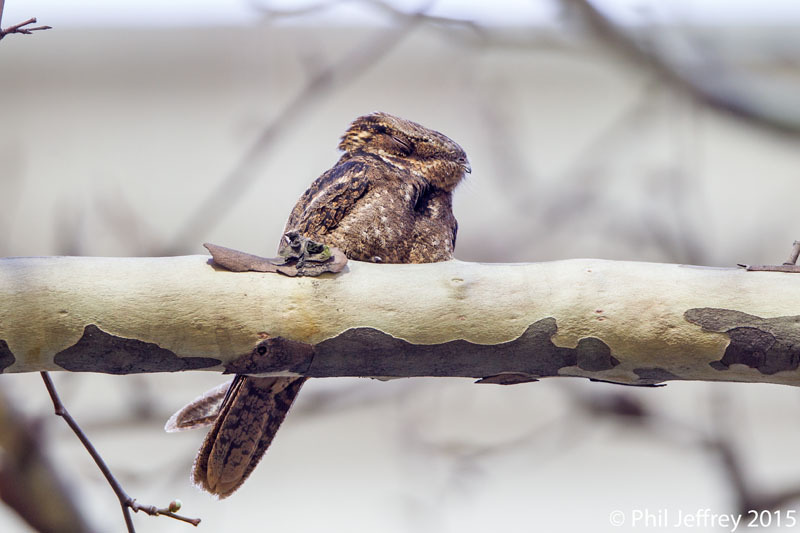 A Chuck-will's-widow was found relatively nearby a few days later on May 3rd - see this link for a fledgeling ID article for how to tell a Chuck from a Whip when viewed from below. Input is always welcomed on this - it's not well represented in the field guides or anywhere on the web. Returning to Piermont Pier on Wednesday I found the persistent and relatively tame Snowy Owl in an even more accommodating location only 30 yards off the road devouring yet another unlucky Ruddy Duck. This owl showed the somewhat atypical behavior of plucking Ruddy Ducks from the water, apparently using only one talon, and was quite a success at it too. Click on the icon or click here to see the pics. An adult Ivory Gull turned up at Piermont Pier on the Hudson River in NY and on the morning of Feb 26th was pretty cooperative as was the prior celebrity of the area - the Snowy Owl - perhaps an example of the Patagonia Rest Stop effect. The Ivory Gull was feeding on the remnants of a Ruddy Duck that the Snowy Owl had caught. The Ivory Gull however only remained for a couple of days. North American populations of Ivory Gull appear to be in rapid decline (see this article for example) and it is tempting to point the finger at Global Warming given its impact on other Arctic ice-dependent species like the Polar Bear. Increased vagrancy might be an outcome of a fragmenting population, but then this could just be a random vagrant. Preliminary pics, prior to populating the Gallery with the rest of them. Click on the icon or click here to see the pics. I spent 6 days over the Thanksgiving weekend reacquainting myself with Texas birding, including areas around Houston but mainly the Rio Grande Valley. In the process I manage to find lifers such as Sprague's Pipit, Cackling Goose, Green Kingfisher and Audubon's Oriole. A trip report is here with some embedded photos (more to come). The Great Kiskadee at left was photographed at Sabal Palm preserve near Brownsville, in the process of swallowing recently caught prey. During an early winter influx of Selasphorus hummingbirds, one of ambiguous identity (probably female Rufous) turned up at a traditionally good site for such birds - Lenoir Preserve in Yonkers. See my hummingbird page for this and other vagrant western hummingbirds in the NYC area over the past few years. This juvenile Clapper Rail was a lot more confiding than your average adult, walking right up to my car at Jake's Landing in southern NJ. However that day even the adults were uncharacteristically cooperative. The trip report from my epic 5,900 mile AZ-NM-CO-WY western trip is mostly complete and the photos from it in are in a gallery folder (old gallery folder here). It will be a little while until I finish culling/editing all 2,000 photos however. Highlights included Flame-colored Tanager, Rufous-capped Warbler, White-eared Hummingbird and White-tailed Ptarmigan. I even have photos of some of them. This adult male Cape May Warbler in full breeding plumage was very cooperative in Central Park on May 7th. I've uploaded two pictures on my recent additions page as well as the Cape May Warbler page in the main gallery. Unusually cooperative, predictably belligerent towards other warblers, it was nevertheless silent while I was observing it. The origin-uncertain Barnacle Goose was still at Eisenhower Park on Long Island on Jan 8th 2006, and proved fairly tame - photos by myself and David Speiser are on this page. A weak cold front on the evening of Sept 23rd brought lower numbers than anticipated but did bring in a whole lot of the typical late fall species like Brown Creeper, Dark-eyed Junco, Hermit Thrush and this Yellow-bellied Sapsucker. This bird is an immature male - despite the extensive mottled brown the very first red forehead feathers are starting to molt in. The cold front also brought a lot of Eastern Phoebes into the park. Most seemed to leave the park on Saturday night (Sept 24th) but this was one of a couple of birds that remained in the Maintenance Field on Sunday. Swainson's Warbler joined the remaining Prothonotary in Forest Park and if you could actually find this unobtrusive bird, it proved relatively tame. More pictures of the Swainson's are here from photos taken on April 16th 2005. Last known sighting of this bird in Forest Park was April 17th 2005. More warbler photos on my warbler gallery. Prothonotary Warblers have also appeared early and in unusual numbers at Forest, Central and Prospect Parks, and elswhere like Jamaica Bay and Hempstead Lake State Park. I spent a fair amount of time observing a tame (and possibly sick?) first spring male Prothonotary in Forest Park on April 16th 2005. More pictures of the Prothonotary are here as well as in the warbler gallery. A Boreal Owl was found and identified by Jim Demes and Peter Post on December 19th 2004, an entirely unexpected find during the Central Park Christmas Bird Count. 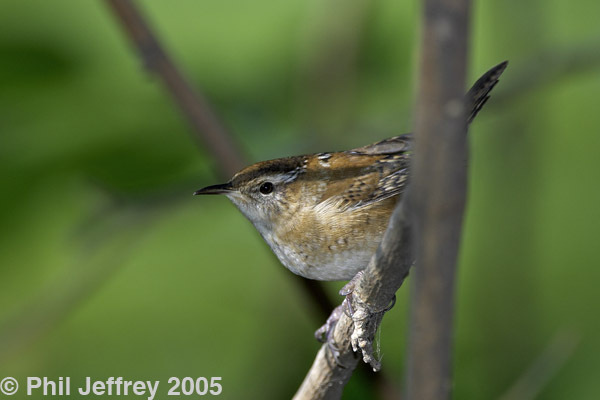 This is the first record for NYC and one of the regionally rarest birds to have turned up in the park. You can see some more pictures of it here and various owl pictures here. The bird was last seen in January 2005. Ruff at Jamaica Bay - Rex Stanford's pictures of the Ruff he discovered at Jamaica Bay on May 17th 2005. I self-host two galleries: the main one at catharus.com (Gallery v2.3) and the original, old and semi-retired one here at philjeffrey.net/gallery (Gallery v1). I've also got two galleries at commercial photo hosting sites: Flickr and Pbase. White-rumped Sandpiper picture used by Swiss Agency for Development and Cooperation for an ecotourism Field Guide about fauna and flora of Apurimac region (southern Peru). The popular Upland Sandpiper picture used for a Nebraska WMA display and a NYS DEC kid's conservation publication. ARKive used tw pictures of Clark's Grebe, on their site photo1 and photo2. 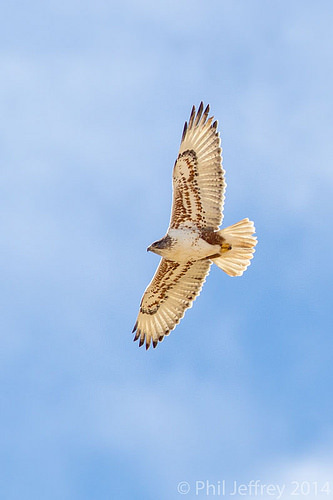 White-tailed Hawk picture used by Cornell's Birds of North America online. I contributed 11 pictures to a Reader's Digest book Where the Birds Are, mainly concerning birds in the eastern region around Central Park - see more details here. My bird photo stock list holds a more expansive listing of images that I hold, but is usually in a state of flux as new images replace older ones. There are stock lists in alphabetic order (above) and also an automated stock list sorted by families for a more conventional viewpoint (courtesy of Un*x shell scripting). I now have bird photo and NYC birding blogs. Harlequin Ducks from my first 2006 visit to Barnegat Inlet (NJ) on Jan 2nd are here. Photos from the AZ-NM-CO road trip. Clapper Rail from Jake's Landing. Harlequin Duck to be inserted. But see here.. Kelp Gull - the Sandgates MD Kelp Gull "Shrimpy". Boreal Owl, Central Park, December 2004. Rufous Hummingbird, Central Park, December 2004. Ash-throated Flycatcher (Prospect Park, December 2004) in the stock list. Purple Gallinule (Prospect Park) in the stock list. 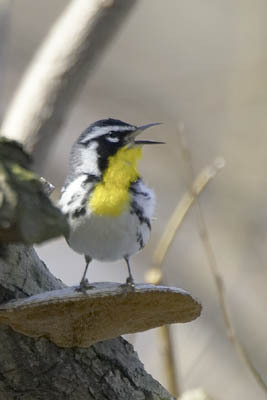 Lawrence's Warbler, Central Park, April 2004. Whip-poor-will, Central Park, April 2004. Common Redpoll and American Woodcock, Central Park, January 2004. Bohemian Waxwing, Island Beach State Park NJ, January 2004. An assortment of recent stuff. Photos from the August 2003 Belmar Pelagic trip. Long-tailed Jaeger eating silk moth at sea. Contentious Hermit X Townsend's Warbler at Jones Beach. Unusual Tropical Parula in TX. A selection of Owl photographs, also here. eBirds NYC resurrected: I've restarted eBirds NYC as a Yahoo Group, following Ben Cacace's retirement from his selfless role as list maintainer for many years. You can subscribe by sending email to ebirdsnyc-subscribe@yahoogroups.com. The archives are publically accessible via the eBirds NYC home page. You have to be a member to post, via ebirdsnyc@yahoogroups.com. I've recently constructed an eBirdsNYC FAQ that deals with (mainly) subscription issues. I'm the list owner and moderator. You can send me email about eBirdsNYC to: ebirdsnyc-owner@yahoogroups.com. I now also have a NYC birding blog. My archive of some of the last posts from the previous eBirds incarnation. NYC Bird Report highlights for Central Park today and recently. NYC Bird Report highlights for Jamaica Bay today and recently. NYC Bird Report recent highlights for Prospect Park, Breezy Point, Fort Tilden, Jacob Riis Park. NYC Metro Birding Briefs email list [*]. New York State email list [*]. New Jersey Rare Birds email list [*]. New Jersey Birding email list [*]. Northern New York email list [*]. Rare Bird Alerts (national) [*]. "Difficult" rare birds (national) [*]. Where do you want to go birding: New York. Where do you want to go birding: New Jersey. Hudson River Audubon (Yonkers etc). Patuxent Bird Banding Laboratory (to report banded birds). Dianne Taggart's Long Island birding site including sightings section. Newsday site for Long Island bird species. My post on eBirds NYC about Long-eared Owls and bird photographers (and birders, for that matter) was prompted by some irritation about the behavior of some photographers over the 2003/4 overwintering owls. Note: this was before I took over ownership of eBirdsNYC. 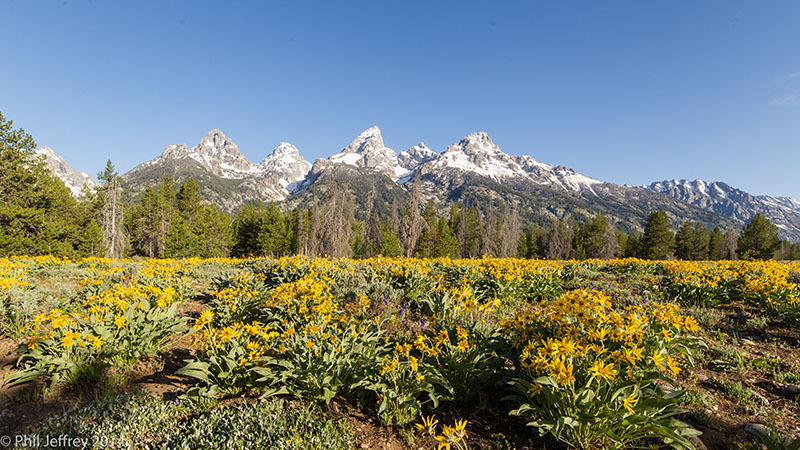 Ethics of nature photography from NaturePhotographers.net. Not that the ethics of birding is any less important, especially in the aspect of taping, but it's been my observation (and others') that bird photographers cause more stress per capita than birders due to the close-approach issue. Related: my previous little rant about Rob Jett and his definition of birding ethics has moved here. Sightings from 2006, 2007, 2008, 2009, 2010, . Sightings from 2000, 2001, 2002, 2003, 2004, 2005 . Sightings from 1999 and a few from before. I also keep some of my lists online at Bubo listing now although Bubo are exceeeeedingly slow about keeping up with the USA list changes to the point where they may yet become useless. I often rely on other people's published trip reports for trip planning, so hope to try and share the same type of information. These reports are really just fleshed out versions of the planning documents I have for each trip, plus a few embedded photos. Arizona in January 2014 (Nutting's Flycatcher, Ruddy Ground-Dove, Black-capped Gnatcatcher). California Pelagics in September 2013 (Buller's Shearwater, Flesh-footed Shearwater, Ashy Storm-Petrel, Black Storm-Petrel, Scripps's Murrelet, Bell's Sparrow) for five new pelagic species and the recent split of Sage Sparrow into Sagebrush and Bell's Sparrows. Arizona in June 2013 was a productive if arid and hot trip that yielded four life birds (Spotted and Northern Pygmy-Owls, Buff-collared Nightjar and Mexican Whip-poor-will). Florida in April 2013 finally snagged the very elusive Mangrove Cuckoo, the Thick-billed Vireo and the exotics Nanday Parakeet and Purple Swamphen. Arizona in February 2013 was a somewhat frustrating trip that nevertheless yielded three life birds (Le Conte's Thrasher, Western Screech-Owl, Rosy-faced Lovebird). AK (Nome, Kenai Peninsula, Anchorage) June 1st-12th 2012 got me 21 life birds on my first trip to Alaska. Provisional Washington-Oregon in June 2011 (19 life birds ! Short-tailed Albatross !). LA-TX 2011 short trip report pending. Main gain was Bachman's Sparrow and better looks at Red-cockaded Woodpecker. 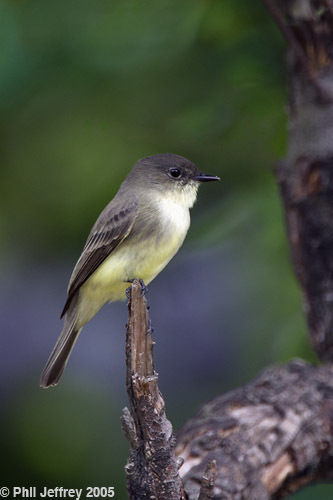 FL in March 2011 (La Sagra's Flycatcher). TX in January 2011 (Black-vented Oriole and Rufous-backed Robin). TX in December 2009/Jan 2010 (Northern Jacana and Bare-throated Tiger-Heron). MN-ND-WY in June 2009 (several prairie and western montane birds incl. Baird's Sparrow). Texas in December 2008 (Crimson-collared Grosbeak). Texas in April 2008 (Groove-billed Ani, White-throated Thrush, Black-capped Vireo, Ferruginous Pygmy-Owl etc). Arizona/New Mexico/Colorado in May/June 2006 (the big "western flycatcher" trip: Cordilleran, Dusky, Hammond's, Sulfur-bellied etc). Brief notes for Florida trip in Mar/Apr 2002. Texas and Florida in Mar/Apr 2000. Florida Keys and Everglades (Dec 1998). My 10 cents on bird photography systems (revised but uselessly out of date now - avoid). Visual illustration of focal lengths. For the thicker-skinned amongst you, see Arthur Morris rant on the internet (this was copied from the photo.net Nature Forum, but the thread on photo.net has subsequently been edited to increase the average civility in the discussion). I particularly love the part where he asserts that you can get laser-sharp images with stacked 2x teleconverters (that would be an effective 2400mm f16 based on a 600mm f4 prime). Must have been a pretty soft laser. I'm a Structural Biologist, meaning that I study the mechanisms of protein function via determining their three-dimensional structures at or near atomic resolution. I use X-ray crystallography as the method of choice. I am involved in basic research, meaning that the majority of my results add to our specific or general understanding of the normal and abnormal functioning of the cell, rather than directly applying them to patients. I'm now working at the Department of Molecular Biology, Princeton University as the crystallography facility manager. Before that I had the analogous position at Memorial Sloan-Kettering in NYC, for a number of years. Over the years I've been involved in a variety of research projects, of which the highest profile ones were on the tumor suppressor p53 (mutated in over half of all human cancers), the cell cycle machinery of the cyclin-dependent kinases, and the breast cancer-associated proteins BRCA2 & BRCA1 (part of the DNA damage response pathway). Nevertheless I've done quite a few more structures over the years - very recently I've been doing research in cellular suicide (apoptosis) and regulation by phosphorylation (or rather, dephosphorylation by PP2A) amongst other things. I keep some sort of online bibliography if you're curious - this is often hopelessly out of date, so a simple search for me on PubMed is likely to be more accurate (but ignore work coming from Australia since there's more than one of us with the same name, the remote odds of that notwithstanding). Comments etc to my email address.